“A ‘begum’ is a kind of female Indian rajah,” Dr. Evans notes. 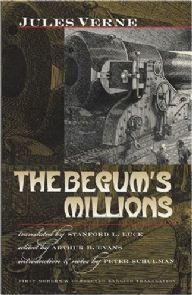 “Published in 1879, several years after the Franco-Prussian War, The Begum’s Millions is one of Verne’s earliest cautionary tales about technology and features his first mad scientist, a certain German weapons maker named Herr Schultze,” the professor adds. Read more about the book at the Web site of the publisher, Wesleyan University Press. Art Evans serves as series editor for Wesleyan’s Early Classics of Science Fiction series, which The Begum’s Millions is a part of, and is managing editor of the journal Science Fiction Studies, which is published at DePauw. Last April, he received the Edwin L. Minar Jr. Scholarship Award along with Yung-chen Chiang, professor of history (the two professors are seen in photo at left). Established in 1981, the award is presented in recognition of exceptional scholarly achievement and is named in honor of its first recipient, a former professor in the department of classical studies.